Investors funneled 46 percent more money and made 56 percent more deals in health care in 2012 than in 2011, with the cumulative funding totaling $1.4 billion last year…The most common theme for investment was health consumer engagement, which represented $237 million in funding…About $150 million in venture funding went toward personal health tools and tracking last year. The quantified self movement is taking off as people are scoop up devices like the Nike FuelBand, Jawbone, and FitBit. You can also view the presentation Rock Health created on Slideshare. So with this report it’s clearly evident why there were so many existing companies with new announcements along with new companies entering the digital health space at CES. Here are a few of the highlights that I saw reported from the show. Last year’s release of the Jawbone Up and Nike Fuelband took the existing model of drab devices to track activity and disguised them as a fashion statement. Those devices garnered lots of attention and helped propel activity tracking to become more mainstream. Existing competing products and companies that weren’t even in the sector took notice and came to CES to join the party. Fitbit was one of the first activity tracking devices released for consumers. Their original tracker is a small device that used a belt clip to attach to a pocket. They announced new evolved versions of their original tracker last year and they’ve also added a scale to their product mix. 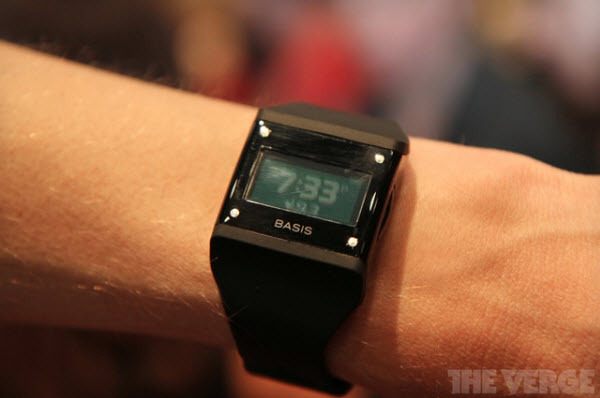 At CES though they finally announced a wristband tracker to compete with the Nike Fuelband and Jawbone Up. The Flex will be released in the spring at an aggressive price point of $99 which is cheaper than the competition. Based on the lower price point and Fitbit’s strength on the service side to display tracking data, I think it will be a hit. It felt a little bit out of left field to hear that LG was entering the activity tracking market with their announcement at CES but after viewing details and a demo of the product it looks strong. 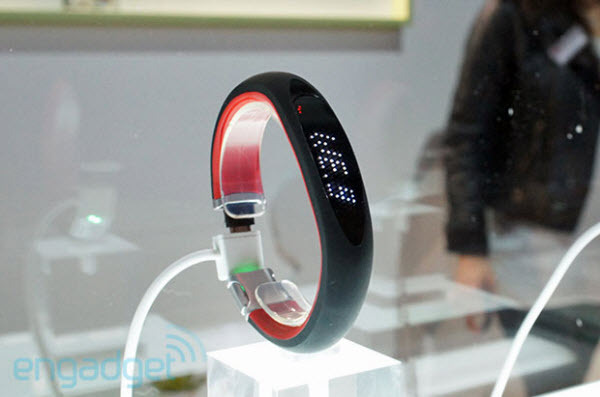 First off this device is much more similar aesthetically and functionally to the Nike Fuelband than the Fitbit Flex. It looks great and has a similar LED display but whereas the Nike interacts via button, the LG has a touchscreen. The tracking app for iOS and Android looks very polished and feature rich. It also has the ability to sync with your phone via bluetooth both for gps tracking as well as having the ability to display incoming calls and text messages. LG also discussed that their still working on trying to add heart rate monitoring to this device which would be killer. All of these features together make it very versatile and could place this unit on top if it can deliver. It’s planned to be released in the summer and pricing is yet to be announced. The Basis which was announced last year has been a highly anticipated new player to the wristband market. Its distinction to other devices is that it not only has an accelerometer, but also has a heart rate monitor, body temperature and galvanic skin response sensors. This allows it to track your body temperature and sweat along with heart rate. These are in addition to tracking standard activity level and sleep. It’s the galvanic skin response and body temperature sensors in the BodyMedia armband I use that adds much more value for me than the Fitbit, Jawbone Up or Nike Fuelband. Those devices track steps (or in the case of Nike a metric the created called fuel) but can’t tell you more details about how vigorous your workouts are. This is something my BodyMedia armband and the Basis can. The Basis which is priced at $199 is the first consumer device I’ve seen to now offer this as well. Beyond creating an attractive device, Basis has focused their efforts on creating value around the data it collects. This will be done by a free web service along with Android and iOS apps which are in the works.This is extremely important as these devices are useless if they don’t provide insight from the data to help you improve your health. BodyMedia is a great activity tracker that has more sensors than competing products as I mentioned above. They announced a new armband called the Core 2. It’s smaller and is more fashion conscious than their previous models. The new one makes the armband which contains the heart rate monitor optional and several different faceplate styles will be available. The unit contains 4 sensors that track body temperature, heart rate, sleep, and other biometric data by capturing 5,000 data points per minute. The new armband will be released in August and doesn’t have an official price but it should be around the current one which is $119. BodyMedia also showed their upcoming Vue patch. This will be a similar tracking device to their Core 2 which you wear for ~7 days and is disposable and will upload data via bluetooth. It’s slated to be released in the second half of 2013 but no pricing information is yet available. 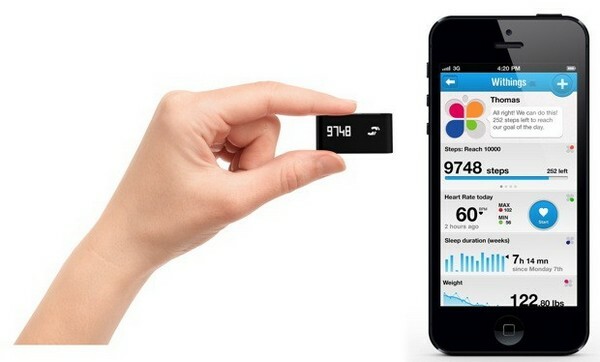 Withings was the first company to release a wifi scale that collected your weight data over time to their cloud service. They also later released a blood pressure monitor. At CES they’ve decided to join the activity tracking sector with the announcement of a new device. Their device has some interesting features which include a pulse monitor and an OLED touchscreen display. Beyond pulse it also tracks activity and sleep. It uploads data over bluetooth to its own app. No details were provided around its release date or price. I find it interesting that this device is similar in size and functionality to compete with the Fitbit Ultra. Ironically Fitbit added a wifi scale to their product line last year to compliment their activity tracker. Withings also announced a new scale which it deems a “smart body analyzer” as its new high end model with more features. The new model has added sensors to track heart rate and air quality oxygen levels in the room in addition to weight, BMI and body fat. The scale uploads data to its app and web service over wifi. It will be released in Q1 and will be priced at $150. The Quantified Self website covered some of the same devices I did as well as some other. They did it in two parts with the first post here and the second one here. 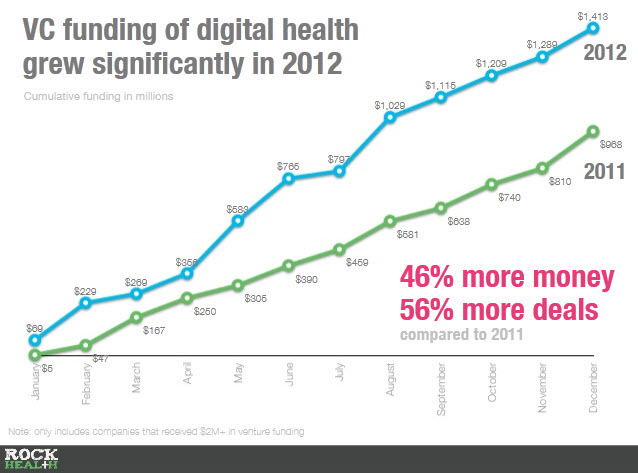 The increasing number of entrants to the digital health sector is a great thing to see. We are seeing new sensors being used in many different ways along with great apps and services to take advantage of the data. I’m sure 2013 will continue to push these devices more into the mainstream. There will no doubt be a shake-up to see which activity trackers are the ones to survive over time. I feel that beyond the aesthetics of the wristbands, it will be the apps and services built around them that will ultimately distinguish which ones break out. A nice looking device isn’t enough. These companies need to provide a nice visual interface to access the data as well as provide insights to help people improve their lives. For the geekier at hearth they also need to have API’s to allow their data to be imported into other health tracking aggregation services like Runkeeper or MyFitnessPal. 2013 is going to be a great year for this sector and I can’t wait to watch it play out. Great in-depth piece on some of the announcements, like you I think I’m my interested in how open this data is/APIs. My co-workers put together page for some of the same devices you covered: http://gdgt.com/showcase/ces-2013-new-fitness-devices/ – It’s been interesting looking at some of the ‘First Looks’ (see product pages) and reading early reviews. Glad you liked it Mitchell and thanks for linking the GDGT post. I hadn’t seen it. The Fitbug Orb was a device I missed. Gadgets always have a soft corner in my heart. But being a fitness lover, tracking all the data of your activities is simply excellent. So i love all the tracking gadgets most is Withings Activity Tracker. Is anyone looking at gaming w/Big Data and powerful Analytics?